Here's a scan of an article that just appeared in this month's Cruising World. Geoff, Thanks for the article. However, I do know that in the case of max-prop zincs, at least the ones I have been using, there is a non-zinc metal band that allows the screws to remain secure even when the since disappears, in my case, that is all that is left. It may be that older zincs didn't have this internal band. You must be buying the (expensive OEM?) version of the MaxProp zincs. I've never seen this. All of mine are just plain zinc. 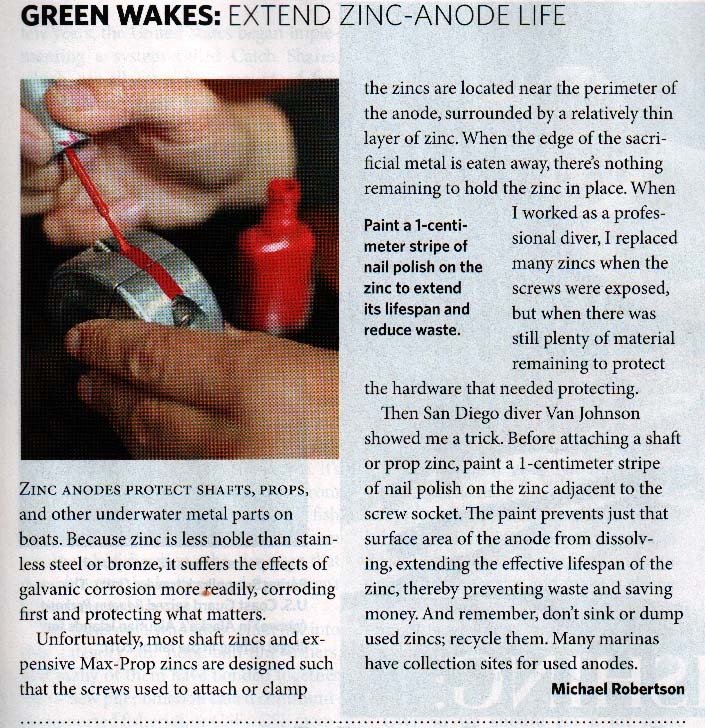 I too was experiencing rapid Zinc consumption on our F-35 so I switched all anodes from Zinc to Aluminum. Problem solved. The source of the zincs could be an issue. Is it possible some zincs are from China now? If, so all bets would be off imo. Mine are stamped CAMP which is made in the USA.